Posted on May 10, 2018 by burkely.twiest@noaa.gov. Although May is the heart of severe convective season across most of the United States, some days still have relatively little severe convective weather. 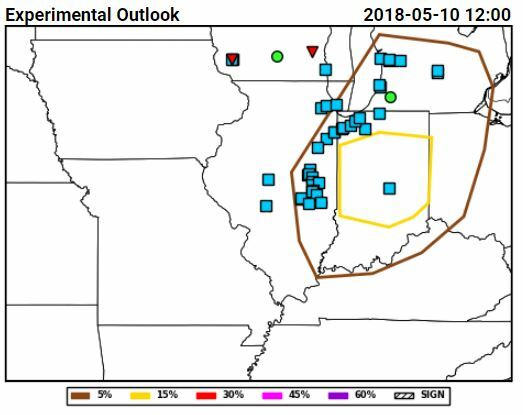 This has been the case for most of this week, with yesterday having the most severe convective reports of the week (48) according to the Storm Prediction Center’s (SPC’s) storm report page. 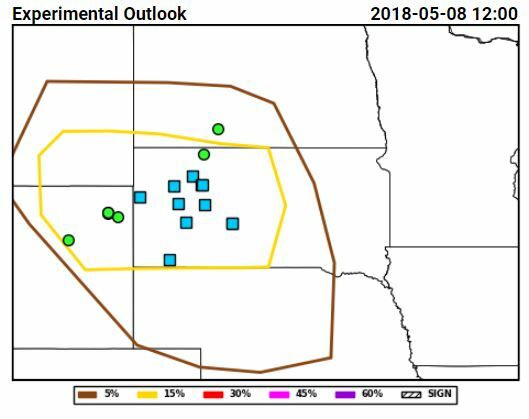 However, just because there are fewer storms occurring doesn’t mean that operations halt during the Spring Forecasting Experiment – quite the opposite! While we may have fewer probabilistic contours to draw if we don’t have as high of probability on a given day, the placement and magnitude of these forecast contours are still a significant challenge. These types of days challenge the models in a different way, showing how they perform on days that are less strongly-forced on the synoptic scale or may not have as much available moisture than the days with more storm coverage. 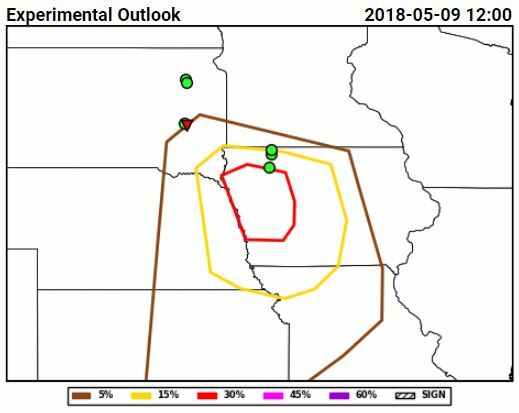 Considering that only about twelve days per year reach the level of a moderate risk according to the SPC, lower end days are far more common and thus require thorough testing as well. This week has so far exemplified a number of different lower risk days, mainly associated with a slow-moving trough progressing across the contiguous United States. 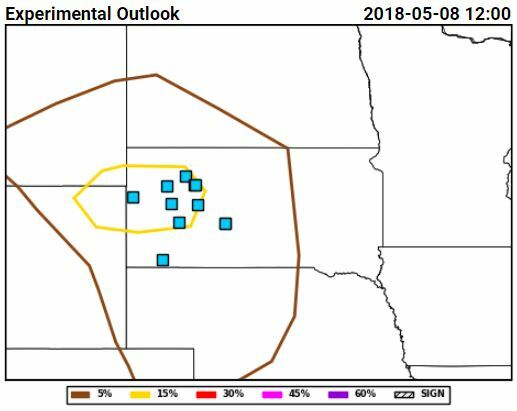 On Monday, a smattering of wind and hail reports affected western South Dakota and eastern Wyoming. Absent of strong upper-level flow, terrain was a large consideration in our forecasts. 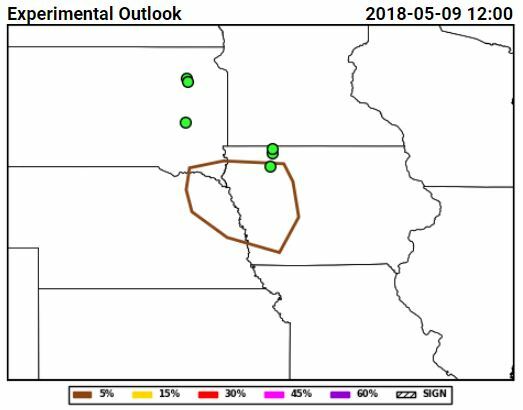 Tuesday saw a handful of hail reports and a tornado report in eastern South Dakota and across Iowa. Ongoing elevated convection in the morning complicated this forecast, as the main area of convective concern was not starting with a clean environment. Yesterday a morning mesoscale convective vortex (which were originally known as “Neddy Eddies” after retired SPC forecaster Ned Johnston) led to questions about when convection would initiate and how well the models captured the relatively small-scale vortex. While these forecasts were far from perfect, we don’t update these full-period forecasts later during the day and issue them by ~10AM CDT. Therefore, these represent our initial impression of the weather for that day after only an hour or two of consideration – and we are getting additional observations and numerical guidance as the day goes on. Particularly on Wednesday, this updated guidance caused us to shift our short time period forecasts (which we do update) as the afternoon wore on. Clearly, more marginal forecasts still present challenges, just different ones than the high-end days. We always have something to consider here during the SFE!